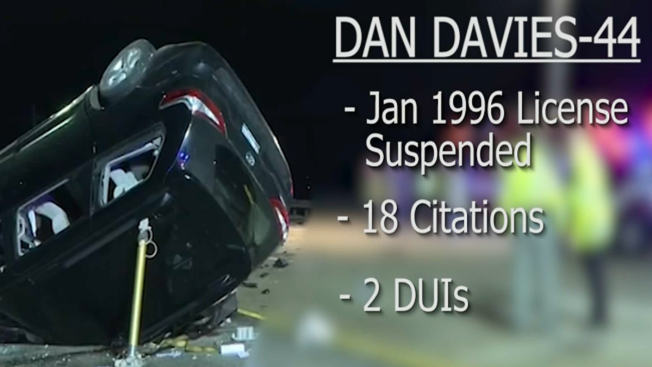 Dan Davies was cited at least 26 times in Cook County for driving without a license. Still he kept on driving, records show, with only occasional attempts by authorities to get him, briefly, off the road. NBC 5 Investigates has found that the man who drove the wrong way on I-94 early Saturday, killing Illinois State Trooper Gerald Ellis head-on, had been cited at least 26 times in Cook County for driving without a license. He also had been arrested repeatedly for DUI, drugs, assault, battery and 50 additional traffic violations. Through it all, he kept on driving, records show, with only occasional attempts by authorities to get him, briefly, off the road. Below is an accounting of 44-year-old Dan Davies’ path through the Cook County court system over the past decades, gleaned from public court dockets and records. The Cook County State’s Attorney’s office has yet to respond to any of NBC 5 Investigates’ questions about any of these cases. 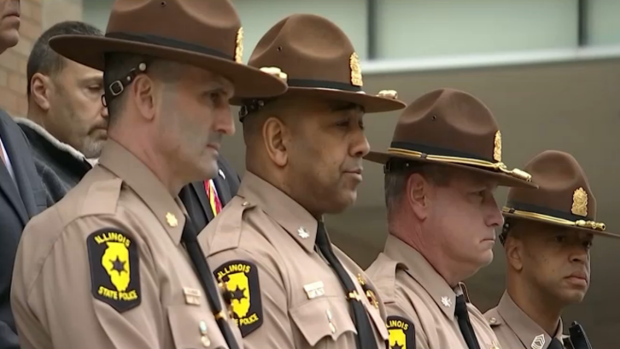 It was another heartbreaking day for the Illinois State Police after a trooper was killed early Saturday morning by a wrong-way driver. NBC 5's Chris Hush has the reaction from the trooper's colleagues, and their plea to Illinois motorists. •	1990: Davies’ dealings with the law began in 1990, when he was a teenager. On four different dates -- March 26, April 16, July 27 and Sept. 18 -- police arrested Davies, each time for criminal damage to property. Each case was dismissed with a bond-forfeiture. • 1991: Police arrested Davies, then aged 17, three more times: Sept. 13, Nov. 25 and Dec. 17. The first was for possession of cannabis, the second for criminal damage to state land and the third for an unknown charge. All three cases were dismissed, one with a bond-forfeiture. • 1992: Davies was found guilty for the first time, convicted of battery in an incident from that April, and received one year of court supervision. •	1993: In January, Davies was arrested for possession of a controlled substance. The case was later dismissed. But in June of that same year, Davies, then 19 years old, was arrested again on an unknown misdemeanor charge. This time he received six months of court supervision. • 1996: Davies’ first traffic stop in Cook County came in January of 1996, when he was 21 years old. Chicago police arrested him as he was driving a 1996 Buick (IL Plate #B91740), for obstructing a driver’s view, operating an uninsured motor vehicle, no Chicago vehicle tag and no valid driver’s license. It appears that he forfeited whatever bond he might have paid, with no other fine levied. NBC 5's Lisa Chavarria has the latest on the third officer killed this year on the road. According to a spokesperson at the Illinois Secretary of State’s office, the office opened a file on Davies sometime after he started getting cited for traffic violations. Davies’ tracking number – D120-1607-4154, which resembles an Illinois driver’s license number, was used to keep track of his citations, so that if he ever came in to apply for a license, they would know his history. •	1996: Late in 1996, Davies was arrested for possession of cannabis and disorderly conduct, both misdemeanors, but both charges were dismissed months later. •	1997: Chicago police stopped Davies, 22 at the time, in April as he was driving a 1997 Pontiac (IL Plate #B508935). He was charged with no valid driver’s license, operating an uninsured motor vehicle, headlight violations and front/side windshield unobstructed. Again, it appears that he may have forfeited a bond, with no other punishment levied. •	1997: Davies was arrested for misdemeanor battery in May, 16 days before his 23rd birthday, but the case was dismissed when the complaining witness didn’t show up to court. •	1998: Davies was arrested, again for battery in September, and again the case was dismissed. He may have forfeited his bond in that case. At this point, there was a lull in Davies’ Cook County court appearances, for about five-and-a-half years, until January of 2004. •	2004: On Jan. 30, police in Chicago Heights arrested the 29-year-old Davies in a 2004 Ford (IL Plate #321A085) and charged him with operating an uninsured motor vehicle, speeding 15-20 mph above the limit and no valid driver’s license. It appears that he posted a $2,000.00 bond. Once again, the case docket says there was a "judgment on bond forfeiture." •	2004: One month later, on Feb. 28, Chicago police stopped Davies as he was driving the same Ford, and issued a single citation of no valid driver’s license. He paid a fine of $125. •	2004: Just two days later, on March 1, Chicago police once again stopped Davies, still driving the same Ford, and once again charged him with operating an uninsured motor vehicle and no valid driver’s license. The case was dismissed five weeks later, for want of prosecution. •	2004: A few months later, Davies, then 30 years old, had his first encounter with Illinois State Police, when he was arrested in June of 2004 while driving a 2005 Chevrolet (IL Plate # 6959354) and charged with driving on a suspended or revoked license and speeding 26-30 mph above the speed limit. These tickets weren’t settled until four years later, on Feb. 6, 2008 (see note below). •	2004: Three months later, on Sept. 19, 2004, Illinois State Police stopped Davies again, this time in a 2004 Chevrolet (IL Plate #506D792) – and charged him with speeding 26-30 mph above the speed limit and driving on a suspended or revoked license. The case included a "judgment on forfeiture" of a $1,000 bond. •	2004: Then in December of 2004, Chicago Police stopped Davies as he was driving a 2005 Chevrolet (IL Plate # 7010757) and charged him with disregarding a stop sign, operating an uninsured motor vehicle and driving on a suspended or revoked license. These tickets were some of several that were ultimately settled on Feb. 6, 2008 (see note below). •	2005: In May Davies was arrested by Chicago police for possession of heroin, but the case was dismissed two months later. •	2006: In January Chicago police arrested Davies for possession of crack, but less than a month later, the charges were dropped. •	2006: In November, campus police at the University of Illinois Chicago stopped Davies as he drove a 2007 Oldsmobile (plate # 8080697) and charged him with driving on a suspended or revoked license and improper traffic lane usage. • 2007: In February, Chicago police pulled over Davies as he drove the same Oldsmobile, and charged him with speeding more than 31 miles over the speed limit, disregarding a red light or stop sign and driving on a suspended or revoked license. •	2007: In May, Illinois State Police stopped Davies, this time driving a 2007 Mercury (IL Plate # 482H663), and charged him with driving on a suspended or revoked license and speeding 1-10 miles above the speed limit. •	2007: Two months later, in July, Chicago police stopped Davies, driving a 2008 Mercury (Plate # 9698073) and charged him with improper seat belt usage, operating an uninsured motor vehicle and driving on a suspended or revoked license. • 2007: In November, Chicago police stopped Davies, driving a Mercury with the same plate as above, and charged him with improper seat belt usage, driving on a suspended or revoked license, no valid registration and operating an uninsured motor vehicle. It’s not clear how this case was resolved. At this point, Davies had been cited at least 13 times in Cook County, driving with no license. •	2007: The next month, in December, Davies, then age 33, was arrested in his car for unlawful possession of cannabis. He was also charged with no valid registration, improper use of safety belts; driving on a suspended or revoked license, and operating an uninsured motor vehicle – as part of Cook County case number 07-1285372. On Feb. 6, 2008, Davies appeared in court on this case, in front of Judge Demetrios Kottaras, who dismissed all five of these charges. However, it appears that several of his past traffic tickets – from June and December of 2004, November of 2006 and February, May and July of 2007 – seem to have come up this same day in court, and it looks like Davies may have been sentenced to some period of time in jail, for some those no-license charges. It’s not clear if Judge Demetrios Kottaras did this sentencing, and it’s also not clear how long Davies may have served. • 2008: If Davies was sentenced to jail, however, it couldn’t have been for long, because Chicago Police stopped him two months later, on April 16, 2008 as he was driving a 2009 Oldsmobile (IL Plate # X393684), and charged him with improper traffic lane usage and driving on a suspended or revoked license. These charges were part of several that were not ultimately resolved until two years later, in August of 2010. •	2008: The next month, Chicago Police stopped Davies again (as he was driving the same Oldsmobile), charging him on May 12, 2008, with disregarding a stop sign, driving on a suspended or revoked license and negligent driving. Again, these charges were part of several that were resolved two years later, in August of 2010. •	2008: Three months later, Chicago police stopped Davies – now aged 34 – and now driving a 2008 Cadillac (IL Plate # 247K334) on Aug. 23, 2008, and charged him with disregarding a stop sign and driving on a suspended or revoked license. Once again, these charges were part of several that were resolved two years later, in August of 2010. •	2008: Just one week later, Chicago police stopped Davies on Aug. 31, as he was driving the same 2008 Cadillac from the week before. This time they charged him with improper seat belt usage, operating an uninsured motor vehicle and driving on a suspended or revoked license. As with the previous three most recent traffic stops, these charges were part of several that were resolved two years later, in August of 2010. •	2008: Two months later, on Oct. 4, Chicago police stopped Davies as he was driving a 2009 Cadillac (Il Plate # A732193) and charged him with speeding 1-10 miles above the limit, improper turn signal and driving on a suspended or revoked license. As with the previous four traffic stops, these charges were part of several that were resolved two years later, in August of 2010. •	2009: The Burnham Township Police Department stopped Davies, now aged 35, on July 8, 2009, while he was driving a 2009 Oldsmobile (IL Plate # A888795) and charged him with speeding 15-20 miles per hour above the limit, operating an uninsured motor vehicle and driving on a suspended or revoked license. According to court records, Davies was eventually found guilty of the suspended/revoked license charge, and sentenced to jail on January 22, 2010, though it’s unclear for how long, or who sentenced him. •	2009: Chicago Police stopped Davies on Aug. 27, 2009, as he was driving a 2009 Ford (IL Plate # 156L730) and charged him with driving on a suspended or revoked license. This charge was one of several that were resolved a year later, in August of 2010. •	2009: On Oct. 1, Evergreen Park police stopped Davies as he was driving an Oldsmobile (IL Plate #A888795) and charged him with a headlight violation, some sort of charge relating to carrying/displaying a license or permit, driving on a suspended or revoked license and operating an uninsured motor vehicle. Court records say these charges were disposed of on Jan. 22, 2010, perhaps along with the charges from July from Burnham Township. Davies was levied a fine of $825.50 for driving on a suspended/revoked license and operating an uninsured motor vehicle. By this time, Davies had been cited 22 times driving without a license in Cook County. •	2009: Later the same month, on Oct. 31, Illinois State Police stopped Davies as he was driving the same 2009 Oldsmobile and charged him with driving under the influence of alcohol, driving on a suspended or revoked license, speeding 15-20 miles per hour above the limit, disregarding a traffic control device, driving under the influence with a blood alcohol content above .08 and operating an uninsured motor vehicle. This case was transferred to criminal court and assigned as case # 10-CR-04409, where Davies was charged with two class 4 felony counts of aggravated DUI with no valid driver’s license, and two more class 4 felony counts of aggravated DUI with no valid insurance. Davies eventually pled guilty in front of Judge Nicholas R. Ford to one charge of aggravated DUI with no valid driver’s license. The other counts were dismissed. On April 9, 2010, Judge Ford sentenced him to ten days in Cook County Jail (with credit for all time served); two years of probation, and $1,295.00 in fines. His probation was terminated as "satisfactory" – again by Judge Nicholas R. Ford – nearly two years later, on March 21, 2012. •	2010: On June 24, just a few months after Davies began his two-year probation sentence for a DUI, Chicago police arrested him and charged him with several counts of drug possession, assault and battery. The case was continued for several months and seems to have petered out with no resolution. This arrest didn’t appear to affect his probation. •	2013: On Nov. 21, Davies was arrested for possession of more than 30 mgs of pot. The case eventually became Criminal Court Case # 14-CR-00468, in which Davies pled guilty to a class three felony charge of manufacturing and delivering 30-500 grams of cannabis, in front of Judge Stanley J. Sacks, who sentenced him to two years’ probation. (Curiously, there’s an entry in this court docket, noting Davies’ drivers’ license number #D120-1607-4154 – which is the ID number set up for Davies by the Illinois Secretary of State’s office – but definitely not a driver’s license number [since he’s never had one]. It’s unclear how or why it would have appeared in this case). •	2015: On Feb. 23, just a few months after Davies began his probation for his pot conviction, Chicago Police arrested him and he was charged in Criminal Court Case #15-CR-04613 with two felony counts of aggravated battery of a peace officer, and a misdemeanor charge of resisting a peace officer. He was also charged with violating his probation in the 2014 cannabis case, and was briefly jailed by Judge Maria Kuriakos-Ciesil, but in April of 2015 Judge Stanley J. Sacks allowed Davies to be released on bond in the 2015 case. In October of 2015 Davies pled guilty to the misdemeanor charge of resisting a peace officer. The two felony counts were dismissed; Judge Sacks sentenced him to 40 days in jail (with credit for all 40 days served), and Judge Sacks also terminated the probation in the 2014 case. •	2016: The next year, on Feb. 6, Illinois State Police stopped Davies and charged him with driving on a revoked or suspended license. This ticket was not disposed of until November 9, 2018, with community service ordered. According to the court docket, there was follow-up court date scheduled for next month – April 24, 2019. •	2017: In October, Davies was charged with four misdemeanors: Two counts of battery; one of domestic battery, and one for possession of cannabis. The domestic battery charge was dismissed because the complaining witness did not show up in court, but in February of 2018 Judge Vincenzo Chimera found Davies guilty of one of the other charges (the record is unclear as to which charge it was), and sentenced him to three days in Cook County Jail, which he credited as time already served. •	2018: On March 14, Illinois State Police stopped Davies as he was driving a 2018 Toyota (IL Plate # A850177) and charged him with driving on a suspended or revoked license and improper traffic lane usage. But both charges were dismissed less than a month later. •	2018: On Nov. 11, Illinois State Police stopped Davies, again in the 2018 Toyota, and charged him with seven violations: driving under the influence of alcohol, driving under the influence of drugs, DUI with an alcoholic / intoxicating compound, operating an uninsured motor vehicle, driving on a suspended or revoked license, illegal stopping/standing/parking and transporting or carrying alcohol. This case was transferred to Cook County Criminal Court – Case number 19-CR-02676 – and Davies was charged with four class four felony counts of aggravated DUI with a revoked or suspended license, and two additional class four felony counts of aggravated DUI with no valid driver’s license. Once again, Davies’ "drivers' license" – actually the number that the Illinois Secretary of State used to track him – appears in the case docket. • 2019: In early March, Davies appeared in front of Judge Peggy Chiampas and pled not guilty, and Judge Chiampas released him on bond. He made another appearance in front of Judge Chiampas on March 18 when again he was released on bond. Thirteen days later, Davies got into the same Toyota and, according to police, drove the wrong way down Interstate 94 and crashed into an SUV driven by Trooper Gerald Ellis, killing them both.